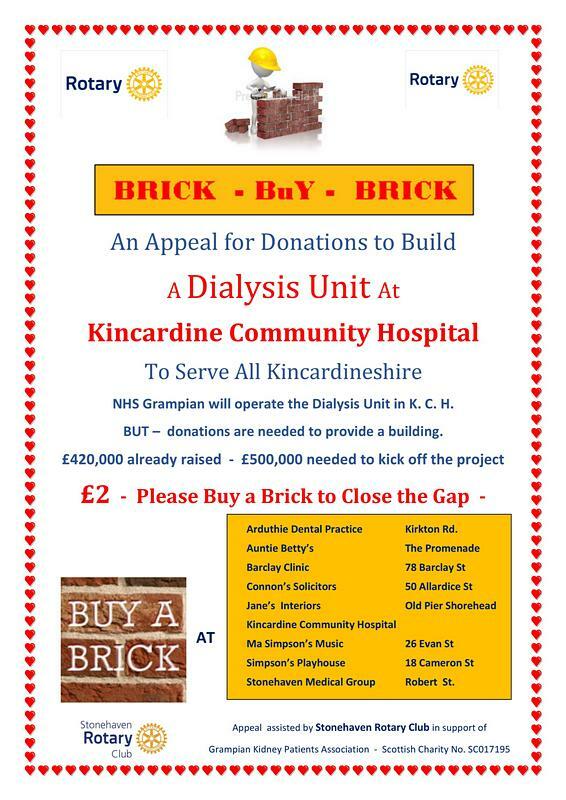 Stonehaven Rotary Club have revealed their campaign to raise funds for the planned new Kidney Dialysis Unit to be built at the Kincardine Community Hospital. This unit will serve all of the communities in The Mearns. It’s called BuY a Brick – see the poster below. The club will be rolling the campaign out at The Stonehaven Harbour Festival this Sunday 24th Aug, when they will ask Craig Brown to BuY the first Golden Brick. Stonehaven Rotary are hoping to involve other Rotary clubs in the unit catchment area, which covers the whole of Southern Aberdeenshire, and where they will also be rolling the campaign out. So head along to the festival on Sunday and buy a brick to get things rolling! Please spread the word – and visit the Rotary Facebook page for more info. Watch out too for their upcoming dedicated website which will report on the campaign’s progress.